It’s a Cantonese expression of encouragement, often heard during sporting events, before exams or said to those going through challenging times. But what I love most about this Chinese saying is the spiritual connotation. And in a city like Hong Kong that relies so heavily on logic, education, and money for its success, it reminds me of Zechariah 4:6, ‘Not by might nor by power, but by my Spirit,’ says the Lord. You see, in the early years of moving to Hong Kong, the complexities of the city with its myriad of challenges, cultural differences and superstitions left me frustrated and often discouraged. But when I stopped trying to fix the situation or person and simply “added oil” by saying, “Lord I cannot, but You can,” I found His grace in abundant supply. As a pastor and leader, “Add Oil” to me is a reminder that my education and finances (my might and power) are sorely limited, and I need the fresh, daily grace of the Holy Spirit. He is willing and able to supply all I need, and more! I’ve discovered the less I’ve relied upon and trusted in my abilities and more so in Jesus and His finished work on the Cross, the more peace, wisdom, and strength I’ve received. But it doesn’t mean that I sit back and do nothing. In fact, the revelation that it’s “by His Spirit” causes me to want to excel even more! Though in all I do, I don’t strive and stress because I trust His Oil has been added to bring all that is lacking. For me, the tangible expression of adding oil means that I use Anointing Oil every day. 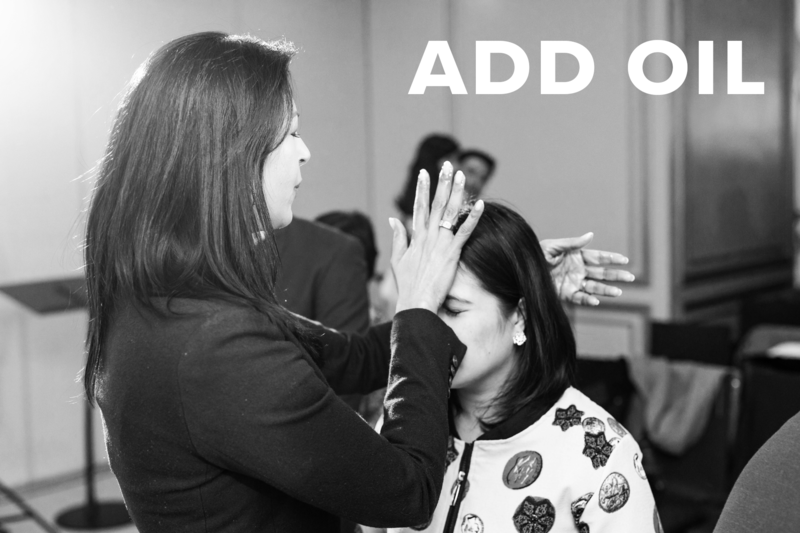 I anoint my head (for wisdom), my lips (for preaching) and my hands (for healing the sick). It’s a physical element I can use to release my faith in Christ’s healing power, provision, and favour. But more importantly, it’s a way for me to be Christ-conscious on a daily basis and passionately believe in what He purchased for me. I know that as I do, those I lead also become Christ-conscious and passionately believe. The more I wholeheartedly rely upon Christ, the more our congregation also wholeheartedly relies upon Him and in turn, they see first-hand the compounding power of God’s goodness and grace in their lives. As a pastor, there is nothing more beautiful than seeing people receive a personal revelation that God loves them, desires them to prosper and is willing they be healed and whole. I’ve discovered it’s a liberating way to live and lead. But what’s even more beautiful is seeing our church also discover the same way of living. So, whatever church you happen to pastor, area you lead, or job you work in, I pray that this year will be one of fresh oil for you. A year where you “add His Oil” to your life and all that you do. A rest-full and stress-less year of the abundant grace, health, prosperity, and favour of Jesus! To find out more about C3 Church Hong Kong, visit www.c3church.hk. This is such a helpful reminder of our dependence on the Holy Spirit, Mary thanks. I too apply daily to myself and family. Great to hear C3 in HK. Blessings and I will pray for your ministry.